There are few dinosaurs as ill-served by their pop culture avatars as Dilophosaurus. Yes, Velociraptor still takes the crown for most persistently (and stubbornly) misunderstood, and perennial favorites such as Tyrannosaurus and Apatosaurus have had it rough as well. But such dinosaurian celebrities have public images that are either in the process of shifting to something more accurate, or have already done so. 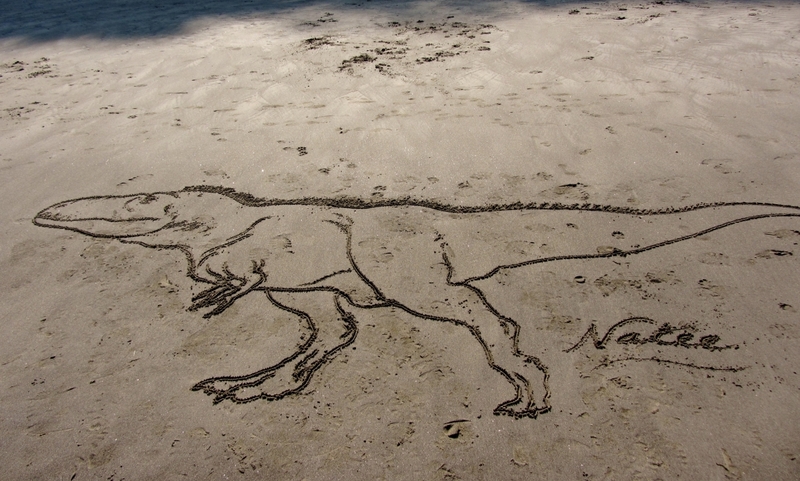 The T.rex in Jurassic Park may have had its anatomical issues, but it was still recognizably a tyrannosaur. 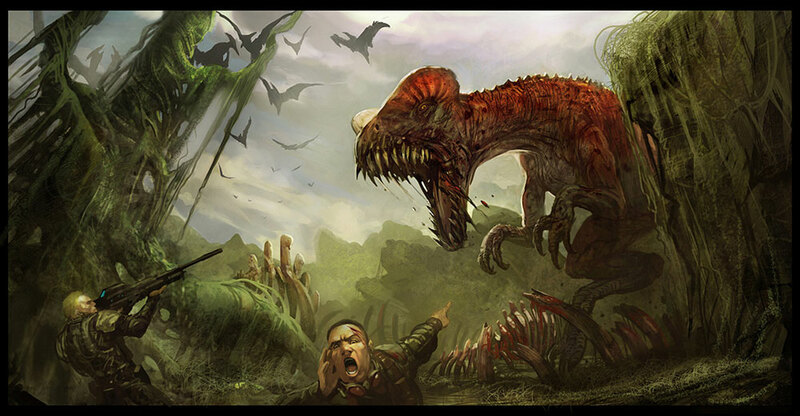 Dilophosaurus has had no such luck. 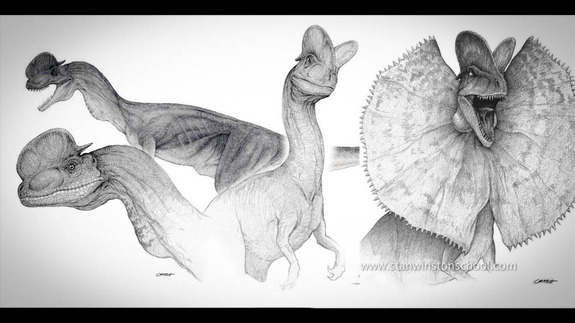 There are some genera that seem destined to always languish halfway in obscurity, and for a long time it seemed like Dilophosaurus would be one of them. 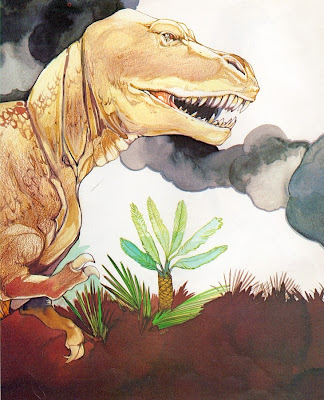 Seldom given pride of place in vintage dinosaur art, often relegated to a simple head portrait in a collection of other theropods, Dilophosaurus managed to escape the sheer volume of trash reconstructions other animals accumulated simply by not being notable enough for most artists to butcher. Most reconstructions slapped the distinctive crests on a generic predatory dinosaur and called it a day. That changed a bit with Jurassic Park. The anatomical inaccuracies of the Dilophosaurus presented in that film have been pretty well picked over, so it's not really worth belaboring them here. Yes, the choice to add a frill is a strange one, though it was probably inspired by the need to differentiate it from the raptors. The utter lack of a notched upper jaw is odder. Dilophosaurus had a fairly distinctively shaped head, and the film's designers instead bestowed it with a blunter, more bulldog shaped visage for reasons known only to themselves. But at least the genus was getting some kind of recognition. The problem, of course, is that much of that recognition is contingent on features the real animal probably didn't have. The crested theropod seems to have established a vague place in the popular consciousness as the "frilled one" or "the poison one." Post-Jurassic Park art of the genus continues to depict a generic theropod, only now with a frill slapped on in addition to the crests. Bulky bodies, amorphous heads, oversized feet. The Dilophosaurus of the zeitgeist is a frill and crests with claws attached. 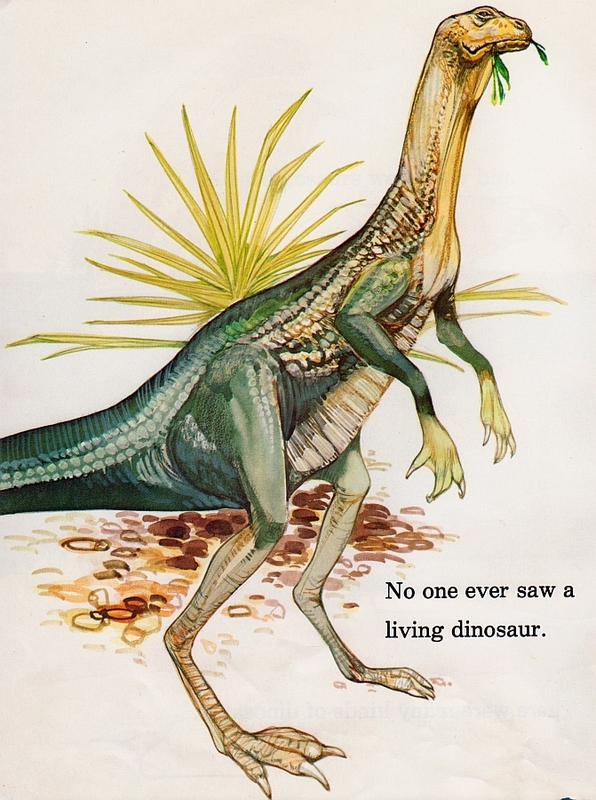 That vagueness wasn't helped by the fact that Dilophosaurus never really got another chance at the limelight. It has yet to appear in another film besides Jurassic Park, and in a franchise that built such spectacular set pieces out of T.rex and Velociraptor, it was badly overshadowed. And when an animal as interesting and distinctive as Dilophosaurus has fewer screen appearances then Procompsognathus, of all things, then something has gone very wrong. The truth is, even a quick glance at the skeleton of Dilophosaurus reveals a rather elegant and slender animal. 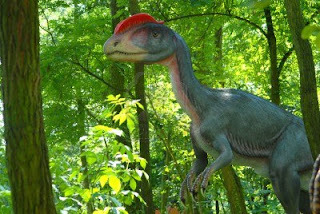 Far from the muscular and boxy beasts of pop culture, Dilophosaurus is a sporty looking predator, long-tailed, long-legged and long-jawed, built with economy and class. Streamlined. No frills, you might say. The design work on Jurassic Park is like adding giant fins and spinning rims to a Ferrari; it punches up an animal that frankly doesn't need it. Moreover, Dilophosaurus is an opportunity for mass media to present a kind of dinosaur they've traditionally had trouble portraying. Most theropods that make their way onto television and film are sold as either giant super-predators or viciously personal threats. 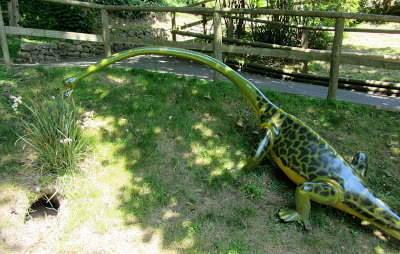 Dilophosaurus, at about twenty feet long, is something different. A mid-range predator, large enough to be impressive, small enough that it seems to belong within a natural environment. 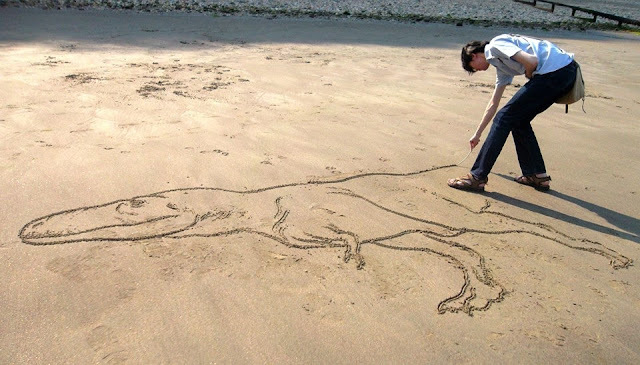 To look at a Tyrannosaurus is to see a monster. To look at a Dilophosaurus is to see an animal. The recent Sideshow model sculpted by Jorge Blanco is a top notch rendition. 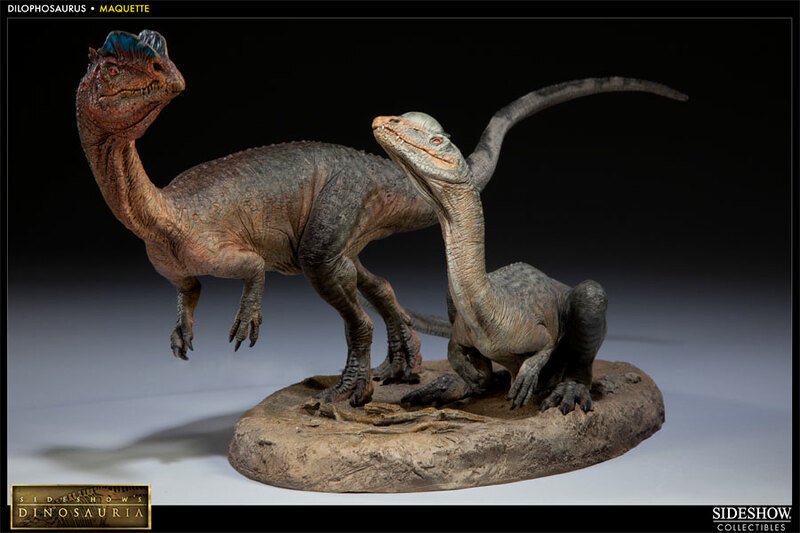 To me, the very things that make the unencumbered Dilophosaurus a tough sell are the things that make it interesting. Popular renditions of dinosaurs are still struggling to free themselves from the monstrous idioms of the past: it's still hard to present dinosaurs as animals and not dragons. But if artists and producers can trust to the essential aesthetics of the real creature, they might be surprised at how rewarding the results can be. By the time the 1980s rolled around, the dead-eyed, acutely depressed palaeoart dinosaur had largely been forgotten. The sprightly scaly things skipping their way through the work of the most respected contemporary artists would soon render them obsolete. 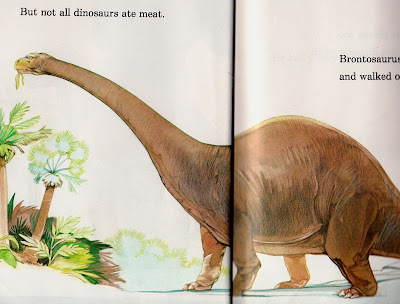 Therefore, I'm quite overjoyed to find this (young) children's book from 1982, in which the saurians are almost uniformly fat and frowning. Hooray! Apparently part of a wider 'Now I Know' series (which can only be commended - knowing is half the battle, after all), the creatures in Story of Dinosaurs plod drearily around a rather washed-out, watercolour world, so tired of their monotonous lives that they hardly seem to pay any heed to looming predators or local geographical hazards. The text is very sparse - this is a book aimed at children learning to read - but this is basically a brief look at dinosaur diversity. 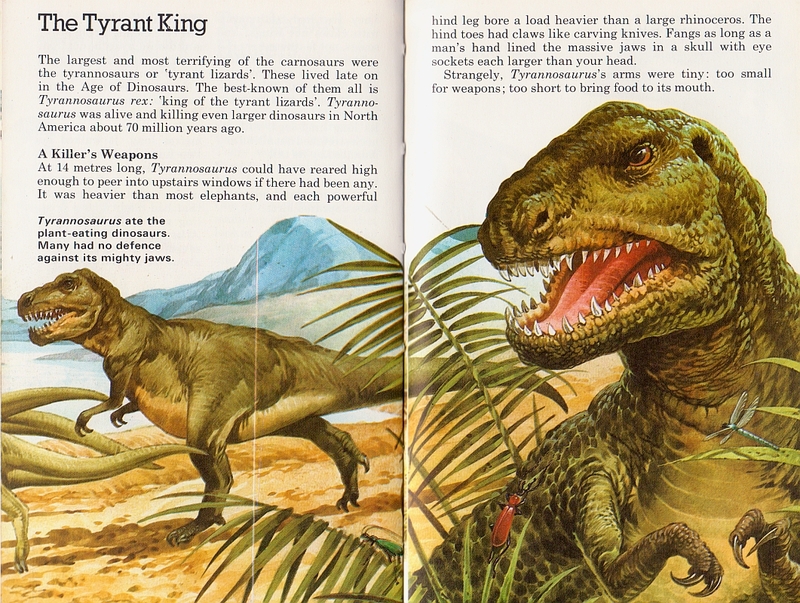 It becomes evident very quickly that the artist (Joel Snyder) had only a limited number of old-timey dinosaur books for reference. 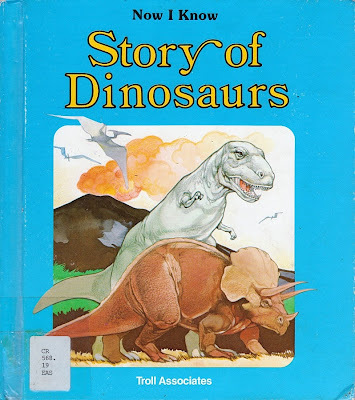 Just a few pages in, and we're greeted with a Neave Parker-esque hunchback theropod and sprawling, short-tailed ankylosaur, a malformed hadrosaur with abelisaur arms, and what I swear is a Euparkeria copied from...somewhere. But this is all as nothing next to the real giveaway, which is that all of the sauropods have bodies like zeppelins, legs like tree trunks and facial expressions evocative of total brain death. 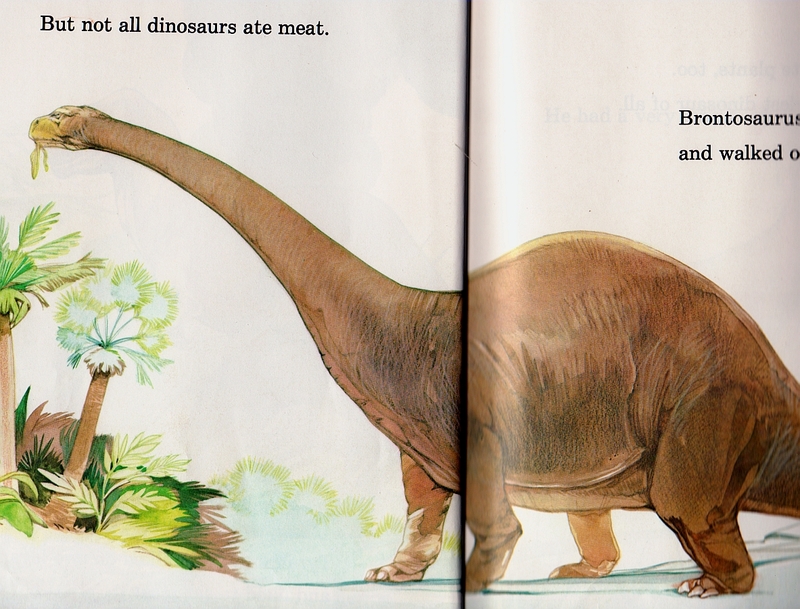 Naturally, "Brontosaurus" is the fattest of all. That's expected - we've seen this sort of thing loads of times before. 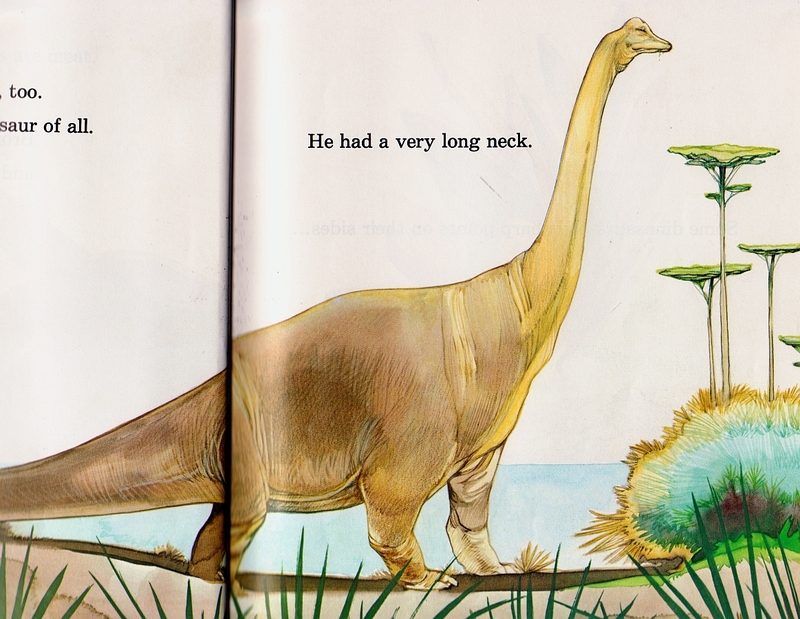 What's more surprising is that Brachiosaurus receives the same treatment. This might just be the lardiest brachiosaur I've ever seen. Normally, the artist will attempt to highlight the fact that the animal's shoulders are higher than its hips, that being a distinctive feature and all. However, here the limbs are all but subsumed by an enormous, doughy mass, the sort of thing you'd normally find being dipped in garlic butter and served up as a starter. I do love its head, mind you. "And what may we suppose that you are looking at?" Fortunately, T. rex is somewhat less obese than it might have been. This is also far from the worst restoration I've seen in a book like this - the teeth are the right sort of shape, the jaws are the right sort of shape...ish. Naturally, Snyder follows the pre-Dino Renaissance tradition of ignoring the various bosses on theropod skulls, and instead giving the animal neat little eye arches because, you know, aesthetics. But hey...not too bad overall. In context. Yes. 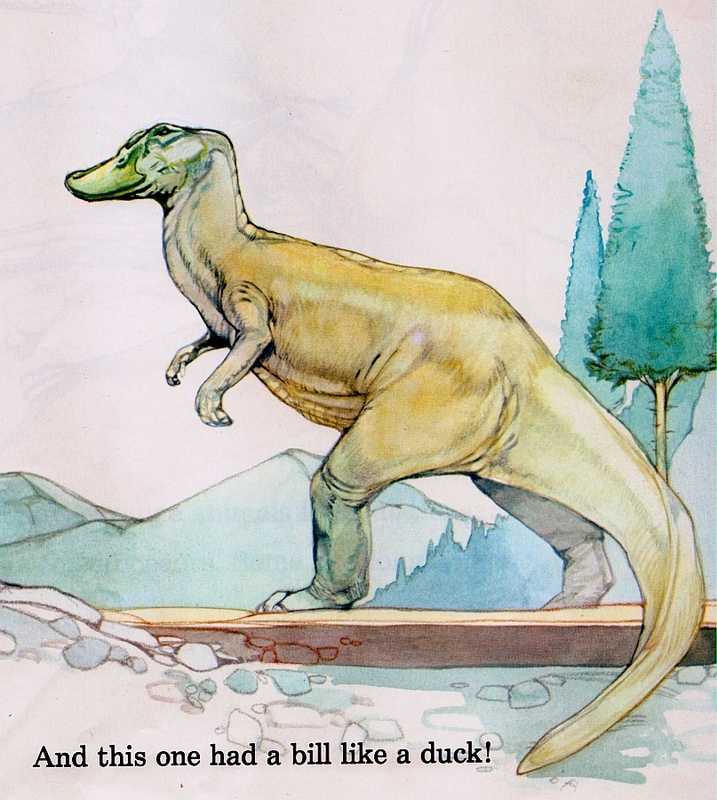 At one point in the Story, author David Eastman turns, inevitably, to dinosaurs that looked a little ridiculous. 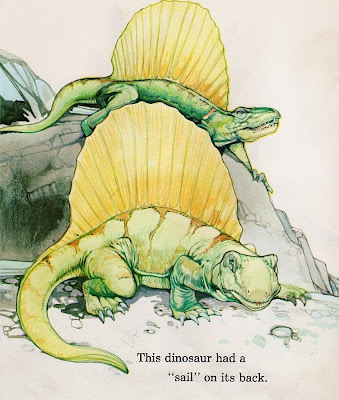 Unfortunately, Snyder illustrates Dimetrodon for what might well have been intended to be Spinosaurus. Although I like the composition, Snyder here falls foul of having so few references, and his Dimetrodon has ended up with a frog's head. And finally...this! 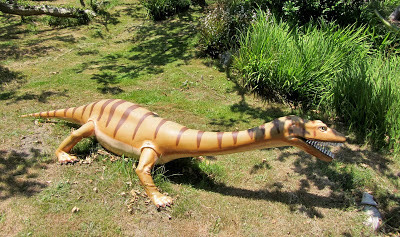 I posted this abomination on Facebook, and the best suggestion I received as to its intended identity was 'basal ornithischian' (1980s 'segnosaur' also cropped up, and was my initial idea). Whatever it is, it is at once really freakin' ugly and quite beautiful, like a vulturine guineafowl or spending a little too much on that excellent Belgian beer the pub had for one week only (Westmalle Dubbel, if you're interested). On the one hand, the patterning is quite exquisite; on the other, it's a grotesque, spindly-limbed chimera with a disdainful turtle head and the webbed fingers of that member of the British royal family that was secretly disposed of. This, friends, is why I keep buying these damn books. I just rolled out some new designs in my Redbubble shop. The four designs are available on clothing in the colors above. 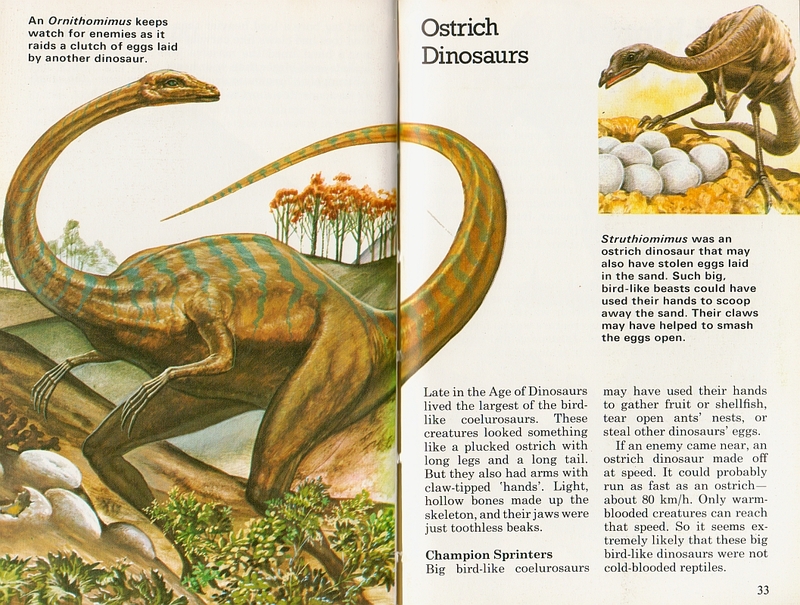 They were driven both by my obsessive need to distill dinosaur forms down to their barest essence as well as my love for a particular trope in dinosaur kitsch I remember being part of my earliest collection of dinosaur paraphernalia, including a pair of pajamas: simple patterns of primary and secondary-colored dinosaurs. My love of this simple motif has inspired me before. This 1.5" badge is a terrific example of the style. And in my mind, the classic Mold-A-Rama souvenirs were kin to them, even if their monochrome nature was an inherent part of the technology. Photo by S. Cassatt, via Flickr. For the life of me, I can't find any images of the pajamas I remember anywhere on the web. 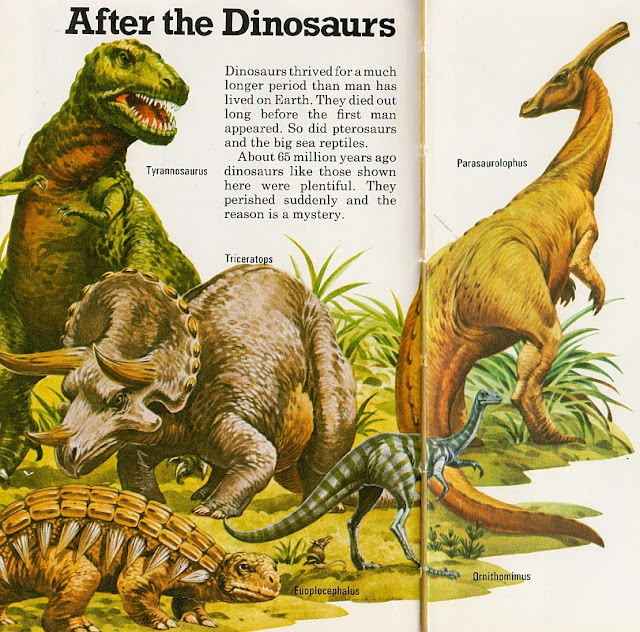 I guess it's not a surprise that no one is selling them on eBay, as any young dinosaur fanatic worth his or her salt would have worn them threadbare. 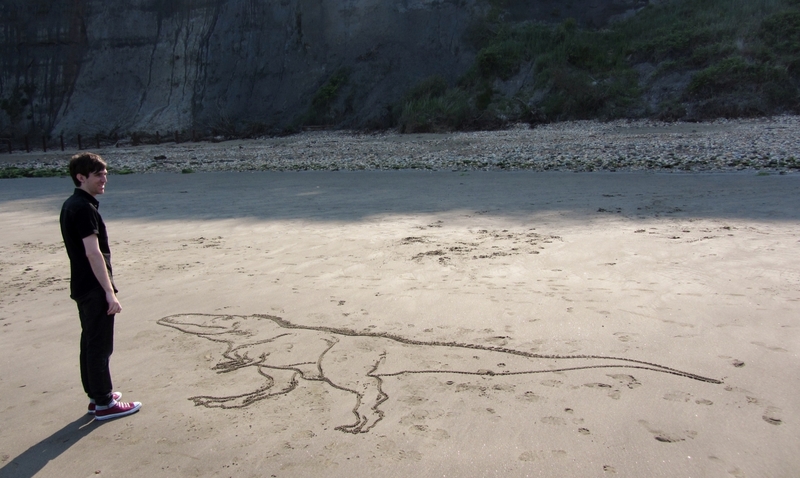 So, anyhoo: more silly Mesozoic Minimalism from yours truly. Unlike my Dinosaur Family Crests, which may yet expand, this set is pretty well complete. If you're so inclined, you may purchase them in my little shoppe. Andy Farke, among many others, is concerned about some of the aspects of new US Forest Service regulations on paleontological resources. Public comment closes on Monday; get informed and see how you can help museums and scientists avoid more hassles in doing their work. Douglas Henderson has announced the publication of Foot Work, Early Drawings from 1977-86, a volume which shares the foundations of his celebrated career. One of Henderson's enduring contributions to paleoart is his devotion to grounding animals in convincing settings, and this is surely the best single place to gain insight into how he has accomplished this. T. rex scavenger or predator "debate" is still bobbing around. Brian Switek and John Hutchinson have both written about it. 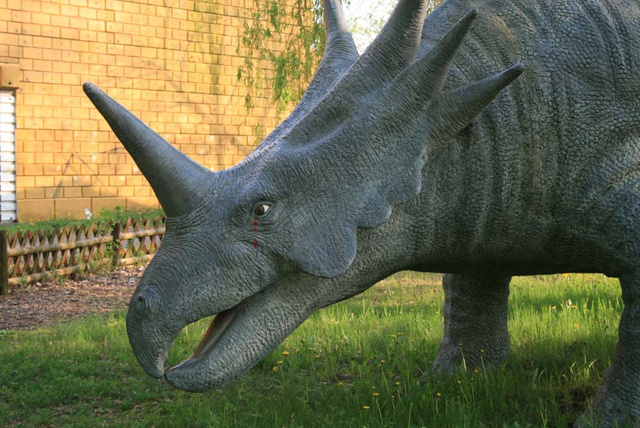 Nasutoceratops has finally been formally described, and based on reaction to my facebook post about it, this is one of those rare new taxa that has the potential to interest the general public. Read more from Dave Hone, Nat Geo, and HuffPo. 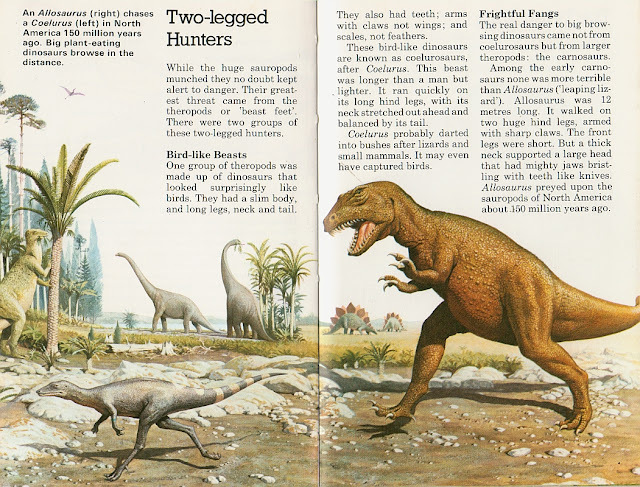 Denver Fowler, who introduced us to the idea of prey-mantling in maniraptorans, has a new blog detailing his work with Horner's Lab, Dinosaur Postcards. Trish Arnold dug deep into that classic dinosaurian pop song, "Walk the Dinosaur," with all the verve we've come to expect from her. At DinoGoss, Matt Martyniuk has written about the identity of "Deinodon," including a new illustration in his current style, which evokes the elegance of 19th century natural history monographs. 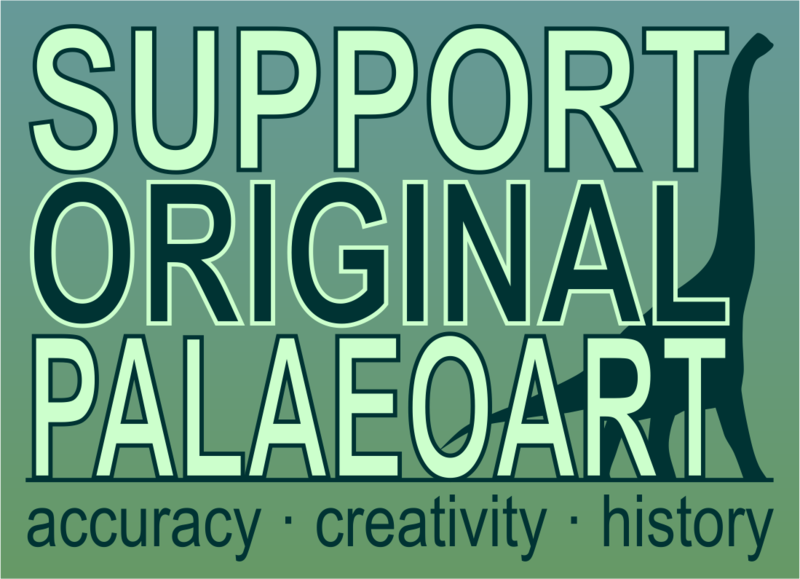 ART Evolved is winding down the paleoart galleries that have been a big part of the online paleoart community for years, and has offered a deadline extension for those who want to submit to the final tyrannosaur gallery. More details here. Heinrich Mallison has been documenting the extant theropods at Zoo Berlin at Dinosaurpalaeo, with his most recent post dedicated to the zoo's Asian birds. At the Integrative Paleontologists, Shaena Montanari wrote a piece explaining just how paleontologists go about finding fossils. Albertonykus has revamped the characters of the Raptormaniacs comic to include recent discoveries. That's dedication! Ian Garofalo has a new blog, Mesozoic Mullings, and has recently shared his thoughts on All Yesterdays and the movement it is part of in a pair of posts. Luis Rey visited the Museo del Jurásica de Asturias (you know, the big theropod footprint-shaped one in Spain, that one), providing a tour diary and photos. Finally, Mark Witton has been writing one killer post after another lately, with his latest detailing his thoughts on the current Golden Age of Paleoart. As you've surely heard, Witton recently had his Pterosaurs volume published, and it's received an enthusiastic thumbs up from none other than James Gurney. 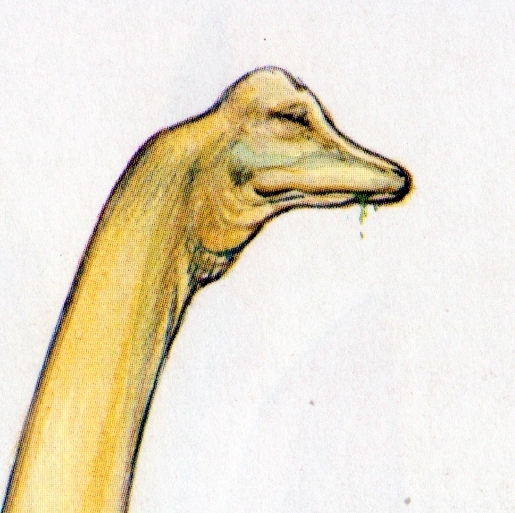 Paul Heaston recently drew this lovingly detailed pencil drawing of Alamosaurus. Click through to bask in its embiggened glory. 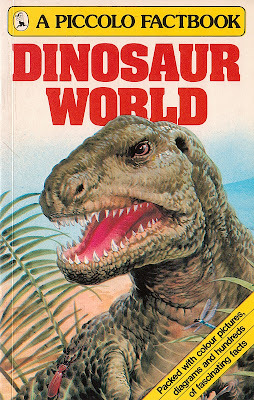 Yet another early '80s dinosaur book written by David Lambert and aimed at a young audience, Dinosaur World is noteworthy for nabbing a load of artwork from all sorts of different sources, and then resolutely failing to credit any of the artists. It's a real shame, not only for reasons of basic publishing etiquette, but because it's always fun to track an artist's progress over time. But what can you do - it's an entertaining book all the same. That it's entertaining will mostly be down to the glorious hodgepodge of pre- and post-Renaissance ideas about dinosaurs, as was common back in the late '70s and early '80s. At the time, artists still defaulted to drawing inspiration from the Old Masters (Knight, Zallinger, Burian and the rest), but updated certain very select aspects of their depictions of animals' anatomy and behaviour in order to move with the times. Of course, the tyrannosaur on the cover is a terrible example of this, as its head's wrong in every detail, and its body appears to be a scaly balloon. Happily, the complete version of this illustration (featured inside the book) does back me up - somewhat - and that's the important thing. The book's title may well be Dinosaur World but, as usual, the Palaeozoic support act feels fit to make an appearance. (If you've got a seating ticket, you'll probably want to grab a few beers in the foyer and come back later.) Before the Mesozoic - before, even, the title page - we're treated, apropos of nothing, to the above monstrosity. It's not labelled, but to the untrained eye (mine) it would appear to be the most foul and eeeevil gorgonopsid that ever lived on planet LV-426. They're coming outta the goddamn walls! And so on. 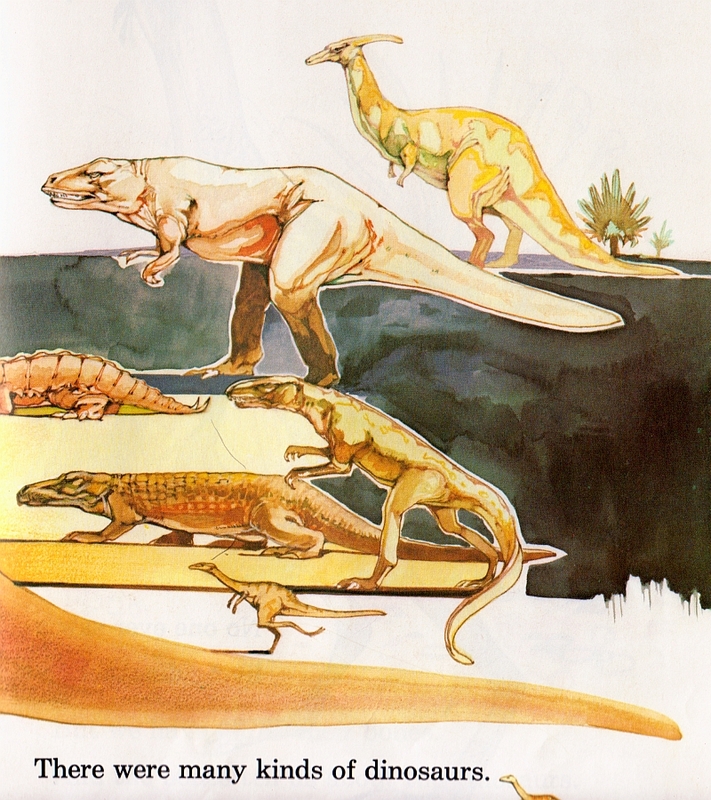 Robinson also provides a few of the book's dinosaur illustrations, including a Jurassic panorama in which the puny twig-limbs of his earlier restorations meet the active poses of his latter work. 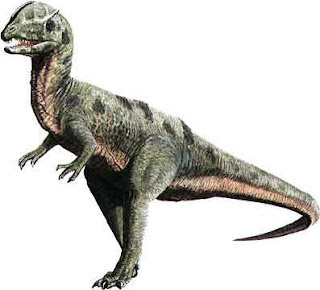 Sure, the Allosaurus could have done with more attention to detail, particularly around the head area (where the animal's stubby, but noticeable horns are annoyingly absent). But it's still holding its tail and at least one foot clear of the ground, and the brachiosaurs in the background are sticking resolutely to terra firma. 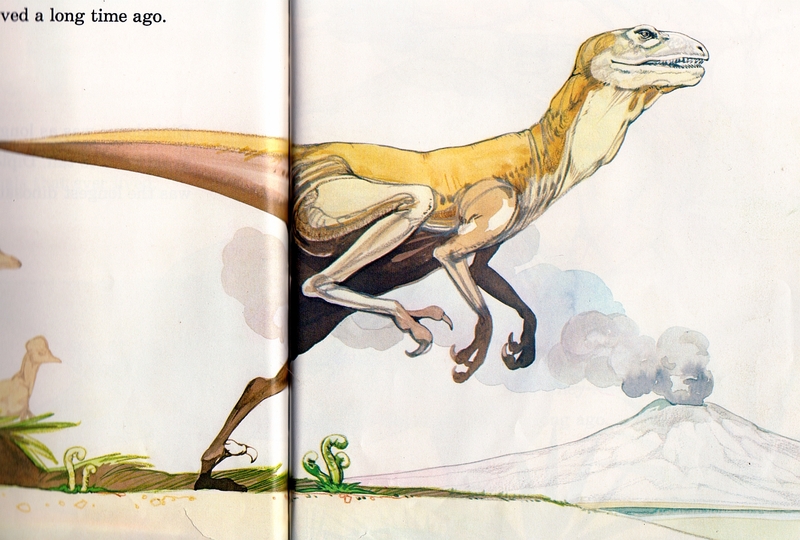 Note the translation of 'Allosaurus' as 'leaping lizard'. Tee hee. It's Iguanodon time! And oh boy, what a horrible mess. Back in the bad old days, artists frequently depicted Iguanodon with dainty, humanoid arms and tiny hands, not to mention elbows that were always, always flexed. This image, then, can be considered the nadir of a particular trend. There's not inconsiderable artistic skill at work here, so presumably the illustrator was just given very little to go on; whatever happened, the consequence is a catastrophic eyesore from top to bottom. 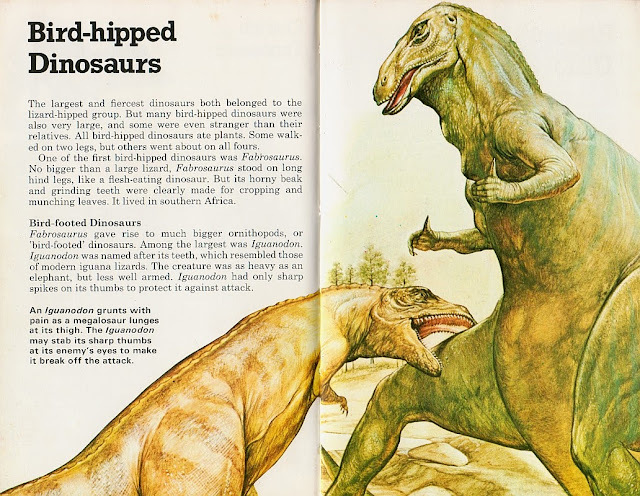 All the way from Iguanodon's drooping lips and thunder thighs down to the megalosaur's (yes, megalosaur's) own withered and delicate appendage (ahem). An excellent comment on this glorious work was provided by Matthew Inabinett over on Facebook. I'll reproduce it here in full. A real goldmine of classic palaeoart tropes! Man in suit Iguanodon with PermaFlex™ arms? Check. Iguanodon and a megalosaur fighting? Check. 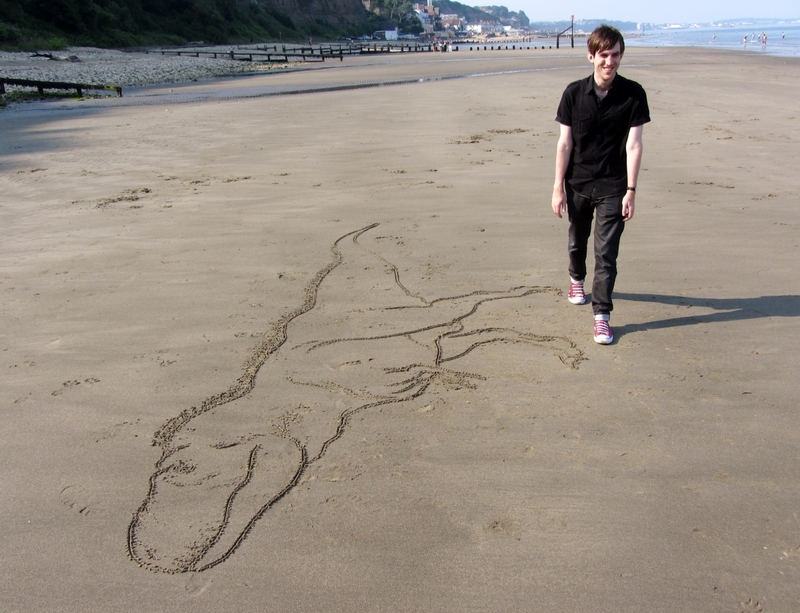 The hunchback megalosaur? Check. Both of the dinosaurs having that scalloped back? Check. 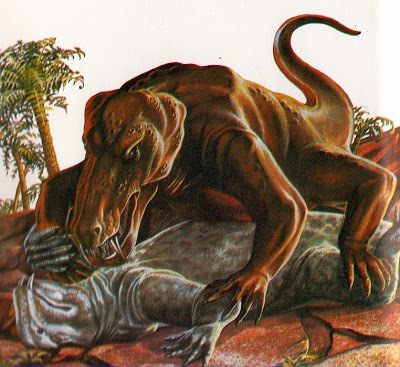 Iguanodon being mentioned to use its sharp thumbs to gouge its enemies' eyes out? Check. Well, it looks as though all is in order here. Carry on. And carry on we shall. 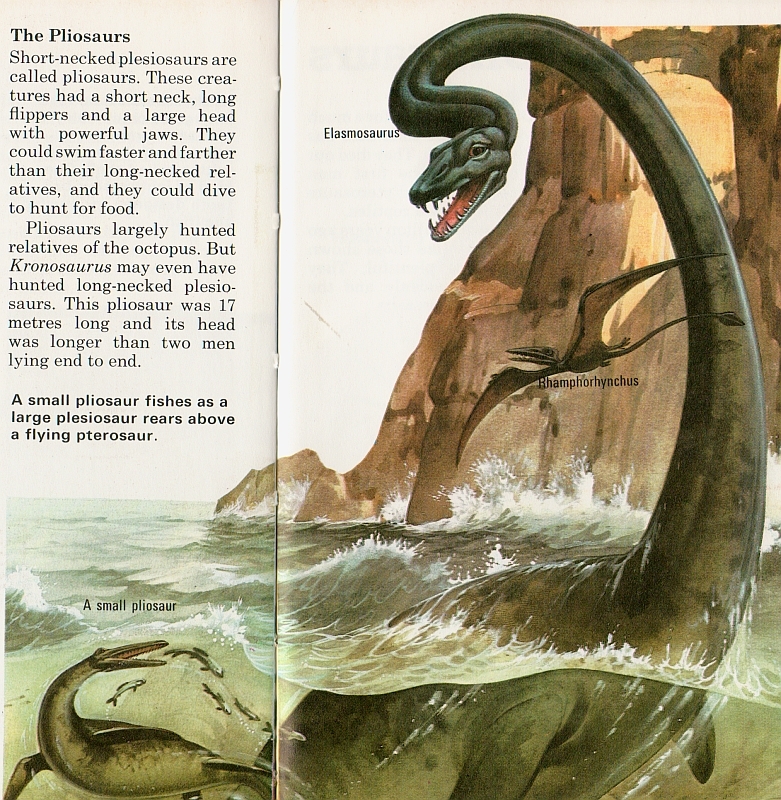 Beautifully painted, but terribly outdated snake-necked plesiosaurs are a favourite trope of mine; they're so marvellously monstrous. Of course, while the scientific consensus is that they couldn't do this, due to a load of boring stuff about biomechanics, pioneering research by myself looks set to overturn this tiresome dogma. By manipulating fuzzy JPEG photographs of plesiosaur skeletons, I have discovered that they could arch their necks, pluck pterosaurs from the skies and drag hapless sailors to their doom. Look out for my book, The Plesiosaur Heresies, out next year. Interestingly, the little fellow to the left appears to be a polycotylid. Don't see too many of them fellas 'round these parts. 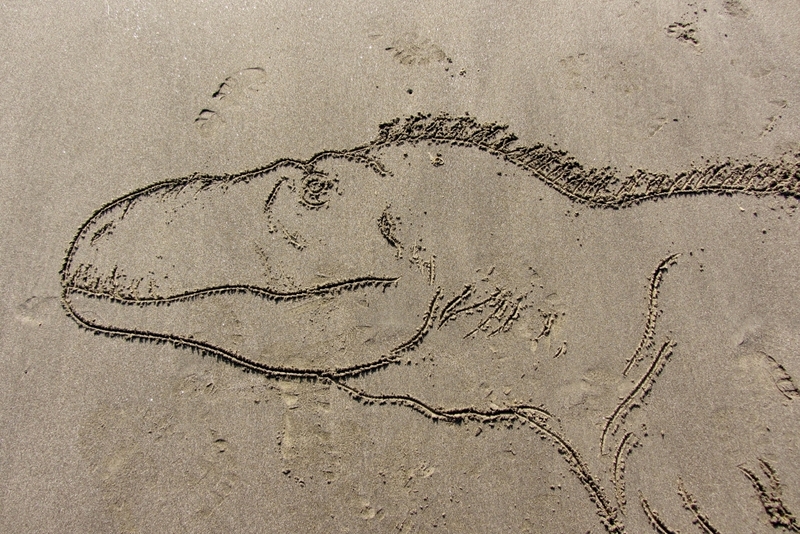 Also, Rhamphorynchus, for some reason. If this, uh, light-fingered ornithomimosaur looks rather familiar to you, that's because it probably should; it's taken from Rourke's Tyrannosaurus, reviewed by David last year. 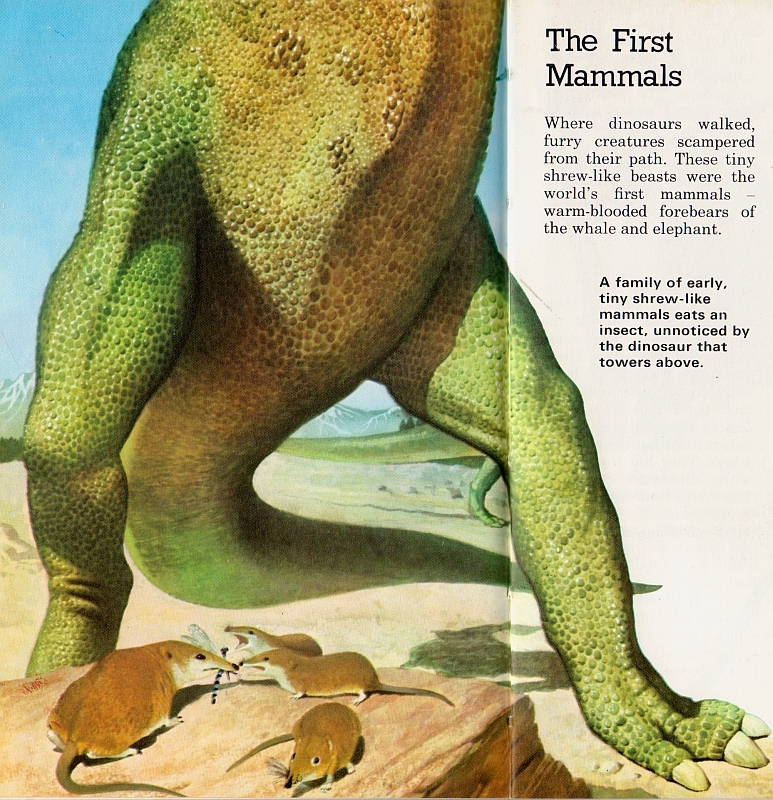 The Parasaurolophus from said book also features, but is far too disturbing to be reproduced yet again here. Note also the illustration in the top right, which neatly fits in with the old trope of depicting ornithomimosaurs as rotund, but with limbs like a cranefly. Rexy's back! And now that we've reached the complete illustration, I may make my point. Sure, the animal in the foreground is rather old-fashioned in appearance, if quite nicely painted. 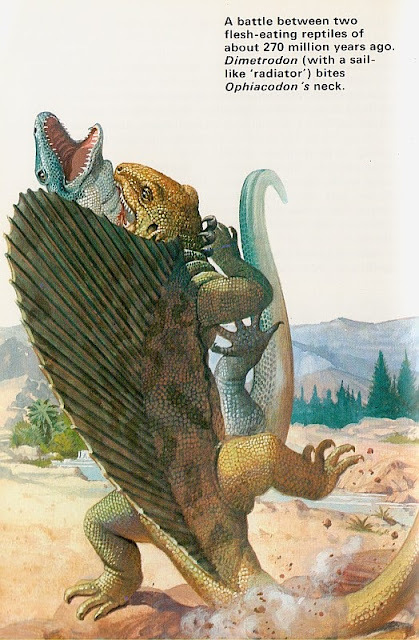 However, the background individual, taking a long stride and with one foot lifting off the ground, shows an energy not present in truly old-school palaeoart. So you see, it is a fitting example of old-meets-new, after all. I do like those insects, too. Quite probably by the same artist (owing to the similar appearance of the bloater T. rex), this assemblage of Late Cretaceous creatures has mostly been included here because...the Euoplocephalus! Look at its cutey-pie face! It's like adorable Old Grampa Turtle. The others may demonstrate the perils of not having access to multi-angled reconstructions (or just drawing freehand and not giving a toss...whatever the case may be), but Grampa's sad face is far too distracting for anyone to notice. Superb. Coming up next: I'm not sure! Can I borrow a book, anyone...? 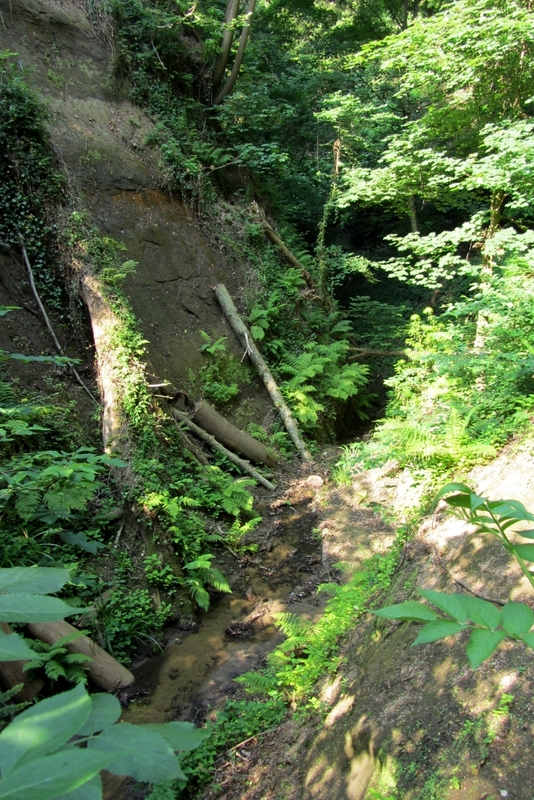 After the visit to Blackgang and its monstrous 'dino-eyesores' which Marc wrote about in the last post, Marc and I headed on to Shanklin Chine, whose beauty almost deserves a post of its own here, if for no other reason than that the gorge could easily serve as a Mesozoic backdrop. The real purpose of this post, however, slight as it is, is this. 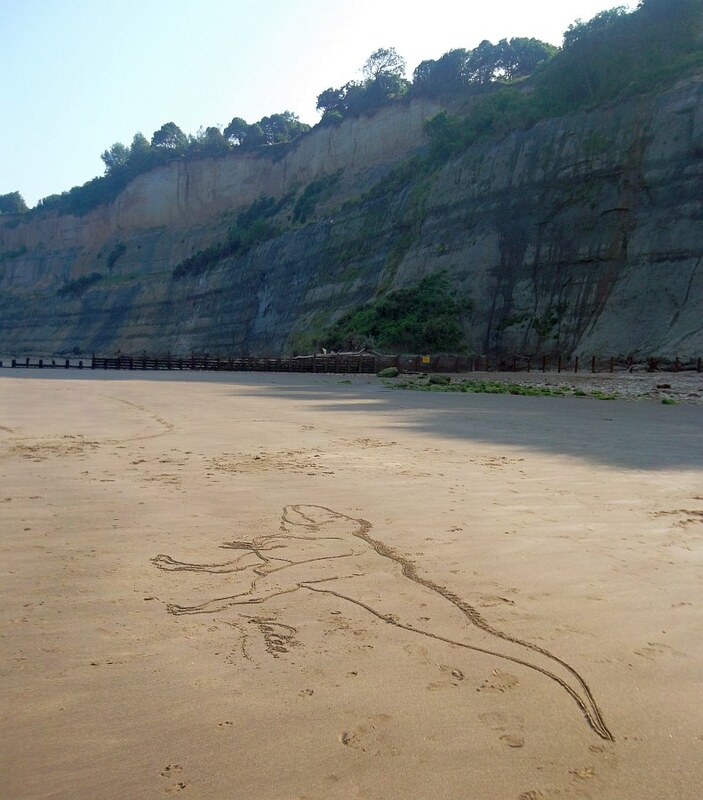 Beyond the chine, the sands of Shanklin beach with its towering cliff face proved an irresistible impromptu canvas. 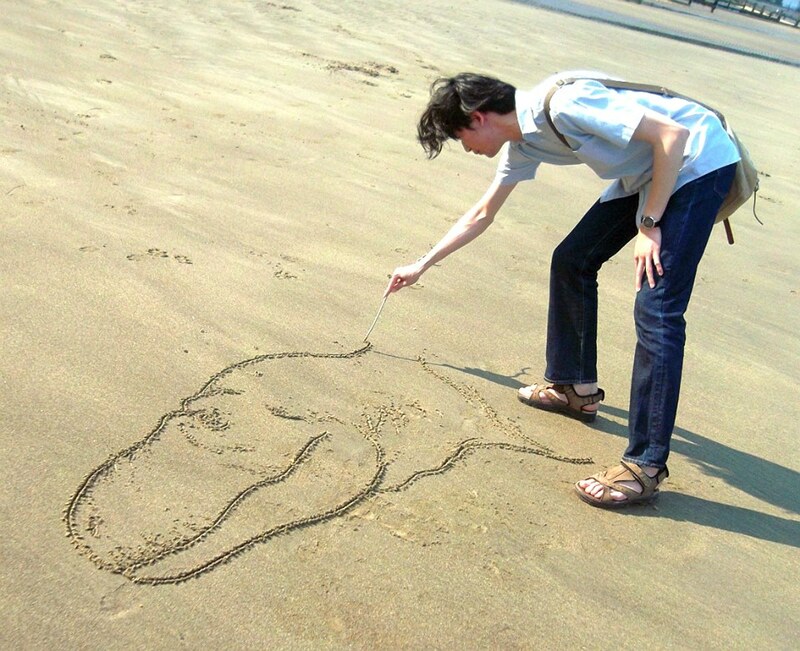 Accounting for some distortion in the photographs (ahem) and the fact that, well, it's a sand drawing completed in about five minutes, I hope readers will not upbraid the resulting shortcomings too strongly. I do have one peeve of my own, however, in that it looked much better without the dermal spines. I regretted adding those about halfway through, by which time, there was no turning back. I was a little late in capturing Marc's tyrannosaur pose, two fingered hands and all. 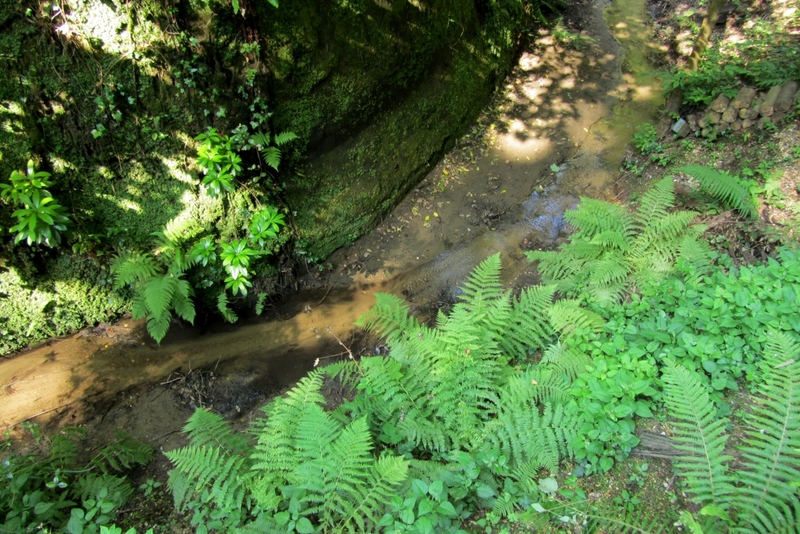 I close with another gratuitous picture from the gorge. It's just too wonderful not to. 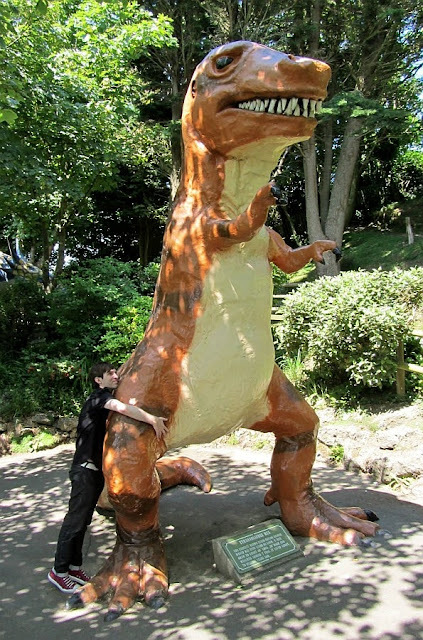 The few remaining long-term readers may recall that, in May last year, I wrote a little post on the hilariously grotesque model dinosaurs of Blackgang Chine, an amusement park of sorts teetering on a cliff edge (literally) on the Isle of Wight. 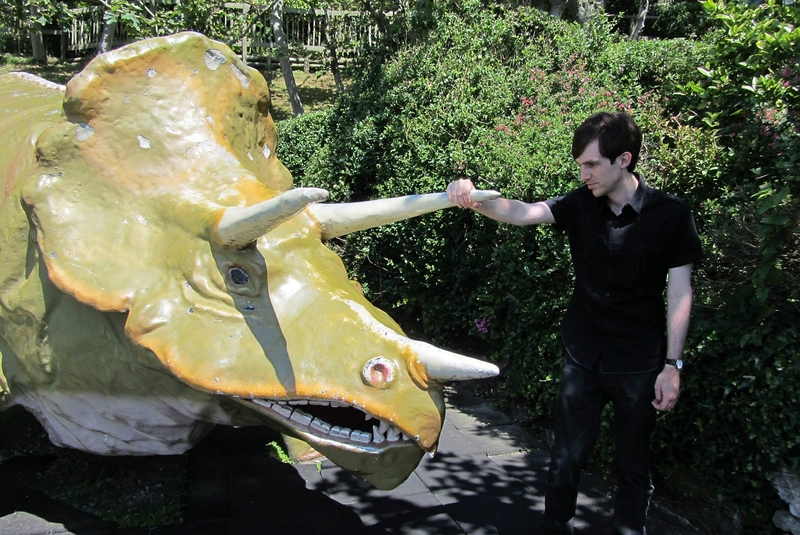 Happily, I returned recently with Niroot and, well, I thought that a few photos of us titting about with the dinosaurs might provide some amusement. 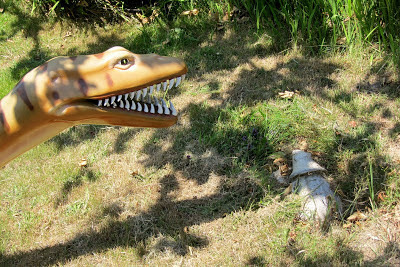 Here, Niroot surveys the perma-grinning head of the bizarre brachiosaur, one of the few models visible on Google Maps (don'tcha know). As noted previously, most of the models date from 1972, and presumably reflect whatever palaeoart the sculptors could get their hands on, which probably largely consisted of the likes of Neave Parker. 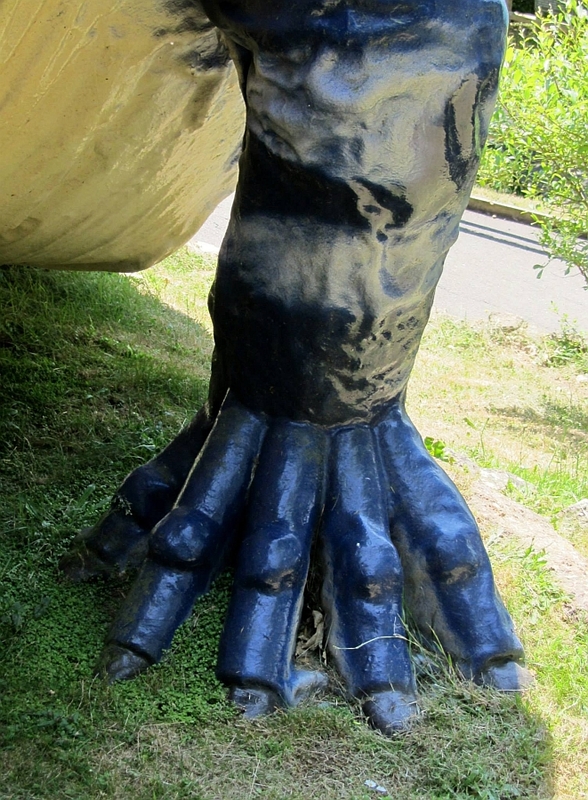 Hence, weirdo lizard feet. In fact, Darren Naish has blamed Neave Parker (all right, he might have been joking) for the park's Polacanthus, seen here taking Niroot for a ride. It's one of many sprawling oddities with body parts jutting in peculiar directions, but it has quite an adorable face. Anyone who asks 'Which one are you referring to?' will be summarily banned. BANNED I tell you. Somewhat less adorable is this guano-smeared Hypsilophodon, which has the terrifying slit-pupil goggle eyes of a Jurassic Park raptor, and is about to bite Niroot's hand clean off. Niroot can surely relate, then, to the plight of this poor baby Protoceratops, isolated from its mother and about to become the highly perforated prey of this scary...thing. There's no explanatory sign whatsoever, but I'm willing to bet that it's supposed to be a nothosaur of some sort (based on a hazy memory of another park). Remember Stegoslug? For my money, it's the most hideous model at Blackgang, even ousting the sad-faced giant mushroom and Old Mother Hubbard (of bare cupboard fame). As you can see, it's also offensively gigantic, dwarfing Niroot with its hulking, lumpen, fibreglass frame. This, truly, is a dino-eyesore. Hurr. 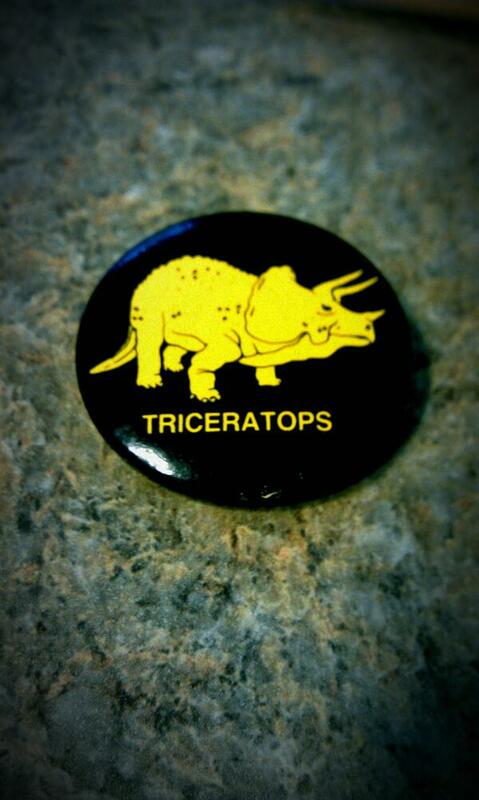 The Triceratops is somewhat better, although its fangs-and-elephant-molars dental combo is a little alarming. Interestingly, photos from the 1970s appear to show this model without the fangs, which means that either they were added later, or the head (or indeed entire model) was replaced somewhere down the line. I write based on the premise that starting a sentence with the word 'interestingly' will make it interesting. 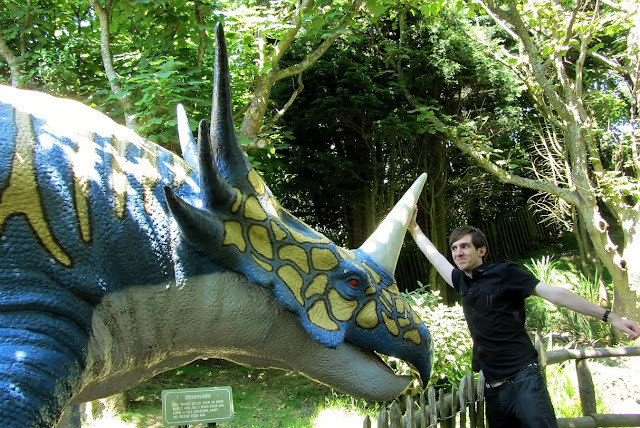 There's a Styracosaurus too, but unlike the Triceratops this mould isn't unique to Blackgang; indeed, it's popped up in several parks in Britain and, believe it or not, globally. There's even one in that creepy abandoned theme park in Berlin. Blackgang's example has the notable advantage of a wild paint job to go with the creative interpretation of the animal's anatomy. Another model that surfaces all over the place is this Tanystropheus, which I neglected to feature last time - finally, I can sleep soundly at night once more. I'm rather fond of the paint scheme on this one, even if the model's boringly commonplace. And finally...everyone loves derpy T. rex. This is a grown man in a full-time job, if not quite yet with a mortgage.